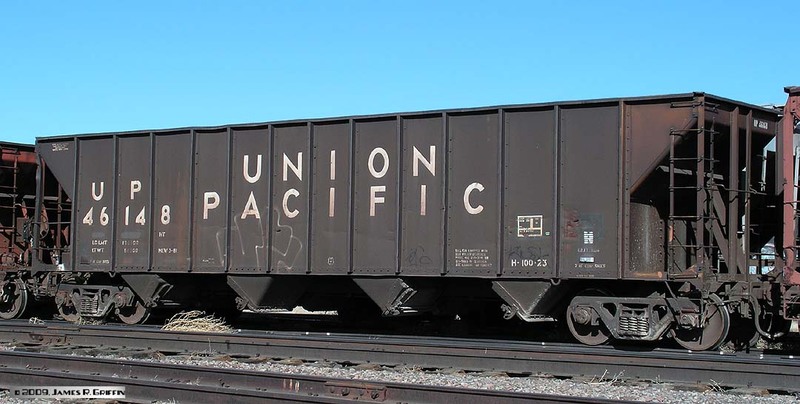 Here’s a sampling of contemporary Union Pacific rolling stock (specifically, freight cars). 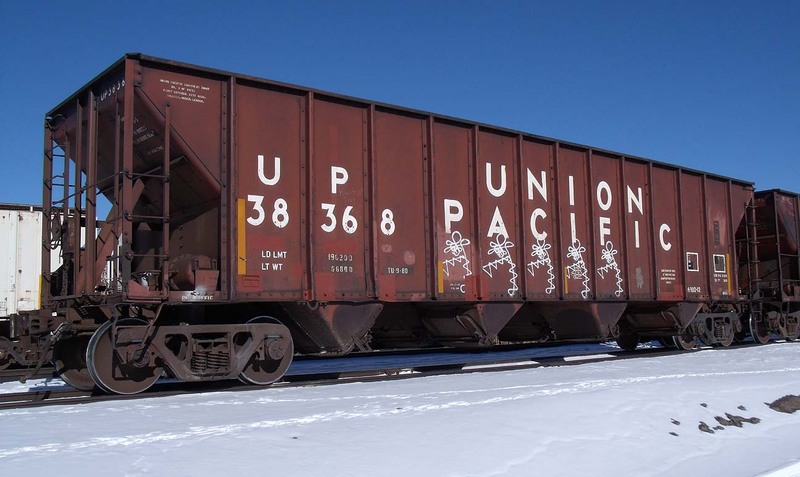 Being the largest railroad in North America, there are untold thousands of cars to be seen, and I have no plans to even attempt to be comprehensive. Cars from some predecessor roads — SP, D&RGW– are covered under those railroads (use menu above to navigate there). Autorack cars, for those who don’t know this, generally consist of two separate structures: the car, and the rack that sits on the car. The racks are considered a separate piece of equipment. 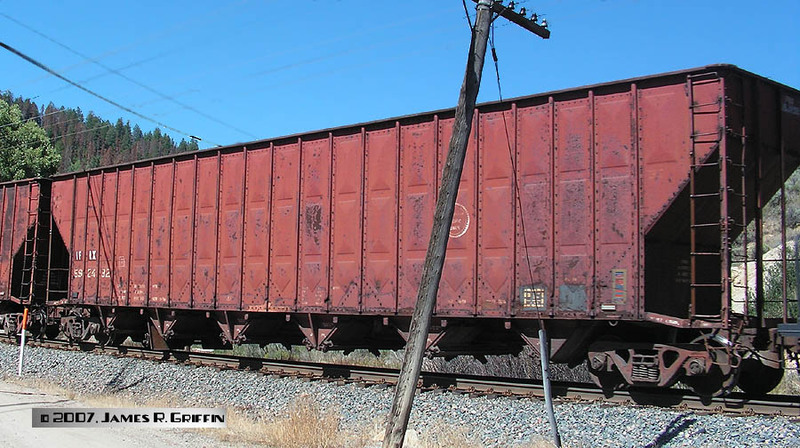 The flatcar below often– indeed usually– is a leased flatcar from a second party such as TTX (formerly Trailer Train). A close-up look at the rack can reveal who the owner is; usually the reporting marks of the owning railroad are given on one of the end panels. Some examples are noted below. 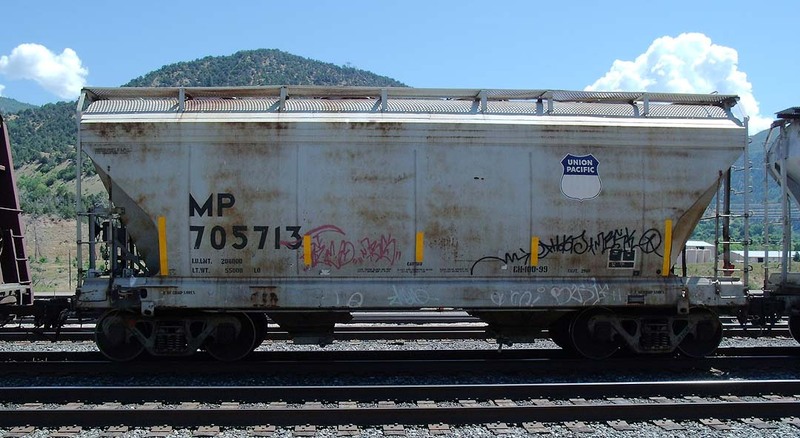 A tri-level rack with marks MP 51765, on flatcar ETTX 820424 (Rincon, NM, 11/04/2007). Here’s a close-up of the rack markings. A lot of racks carry Missouri Pacific reporting marks. Bi-level rack, on TTGX 941236 (Belen, NM, 10/30/2009). A bi-level UP rack on TTGX 981205 (Rincon, NM, 11/04/2007). 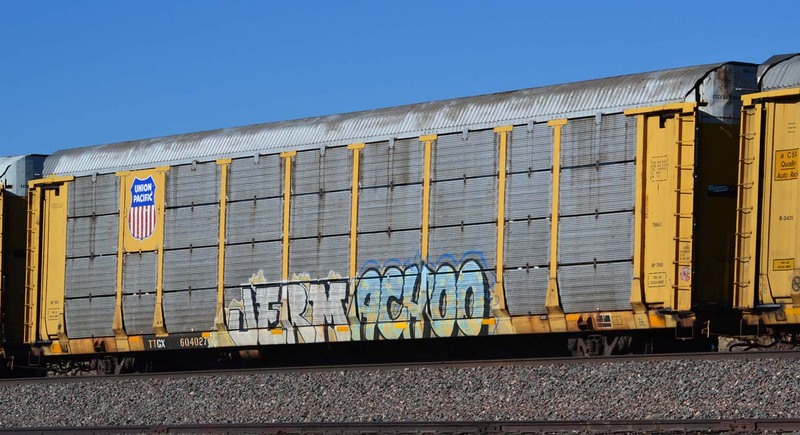 Bi-level rack on TTGX 988213 (Belen, NM, 10/30/2009). This car is a rarity– it has no graffiti visible on this side. Bi-level rack on TTGX 994789 (Belen, NM, 10/30/2009). Tri-level MP rack on ETTX 710087. Another case where graffiti necessitated re-stenciling the car’s reporting mark and number. 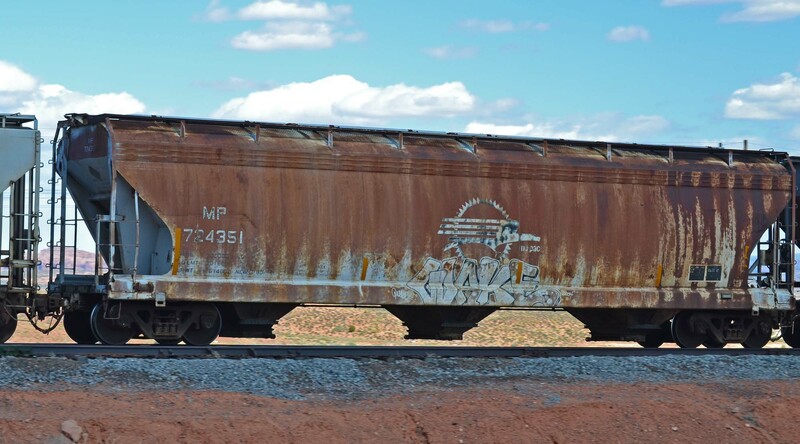 Check out the Ninja Turtle artwork… Southbound NAFTA train at Las Cruces, 8/03/2015. Tri-level MP rack on ETTX 802042. Note that the graffiti necessitated re-stenciling the car’s reporting mark and number. Northbound NAFTA train at Rincon, 5/08/2016. Tri-level UP auto rack, on ETTX flat 802073, passing through Belen in July 2002. A tri-level UP rack on ETTX 803482 (near Carrizozo, NM, 2/18/2008), sans tagging. A tri-level UP rack on ETTX 803538 (near Carrizozo, NM, 2/18/2008). Nice new tri-level MP rack on ETTX 851535. 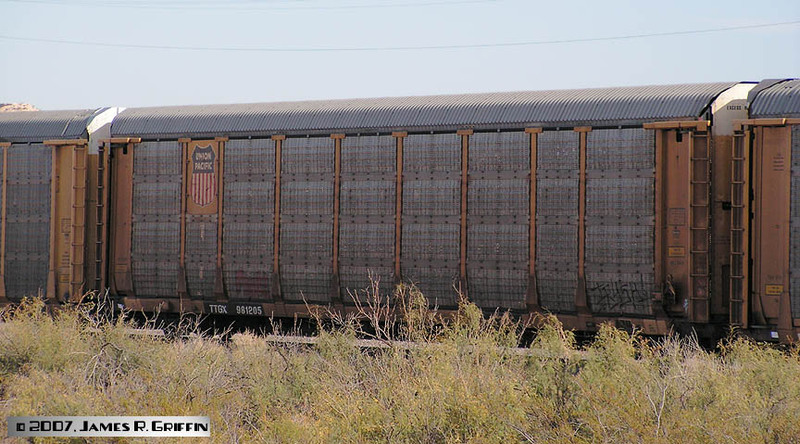 Southbound NAFTA train at Las Cruces, 8/03/2015. Tri-level MP rack 51242 on ETTX 820477. 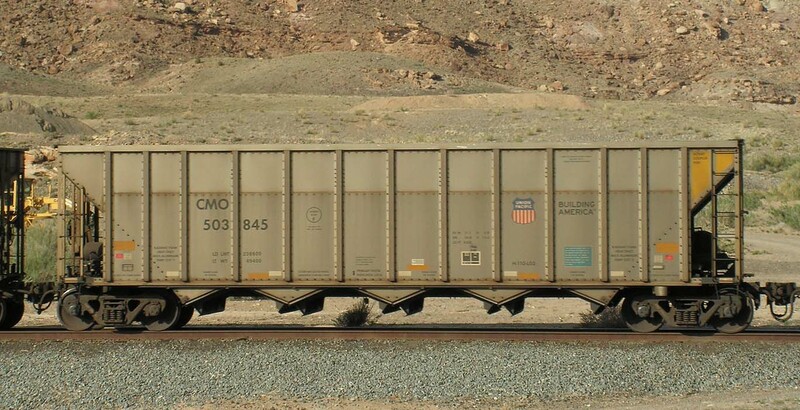 Southbound NAFTA train at Las Cruces, 8/03/2015. A tri-level UP rack on ETTX 902400 (near Carrizozo, NM, 2/18/2008). A tri-level UP rack on ETTX 903885 (near Carrizozo, NM, 2/18/2008). Rusty UP rack 1801 (built by Portec) on ETTX 908252. Note that the graffiti necessitated repainting the car’s reporting mark (which looks like done freehand) and number. Northbound NAFTA train at Rincon, 5/08/2016. Fairly new MP rack 7141 on ETTX 908896. 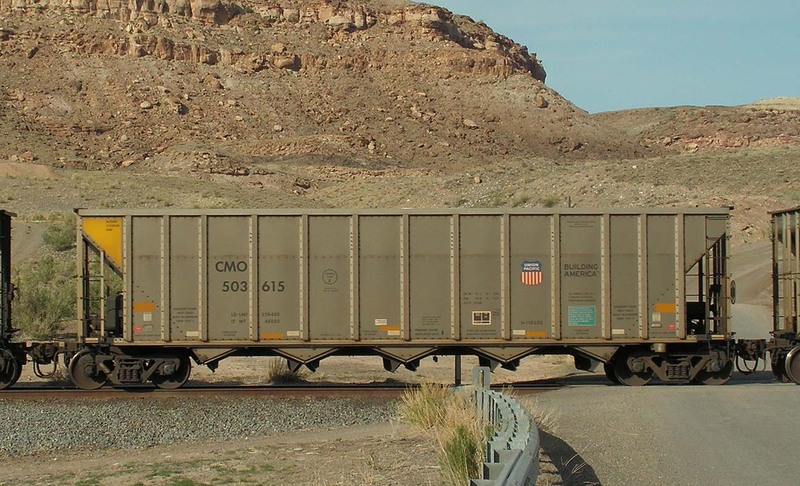 Southbound NAFTA train at Las Cruces, 8/03/2015. 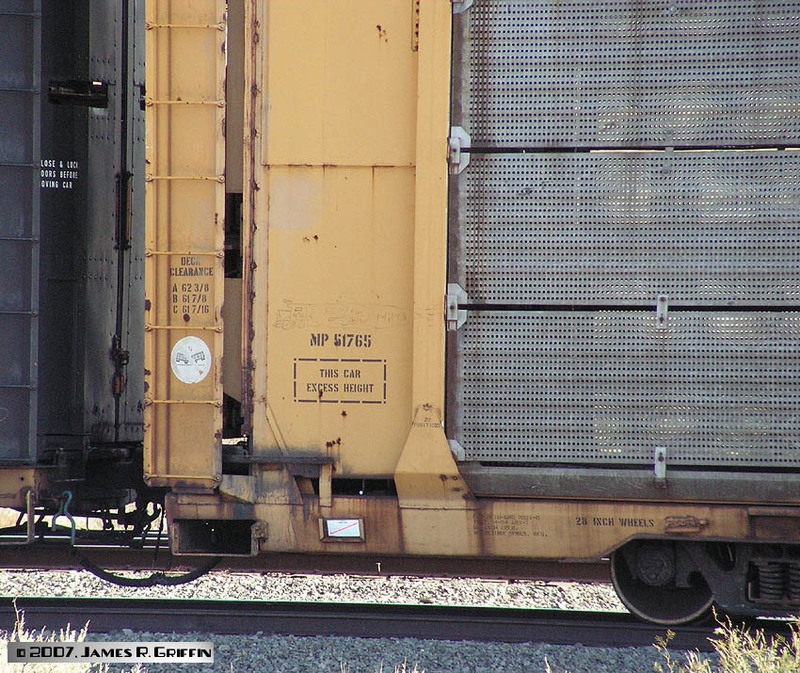 An ex-MP rack on ETTX 909091 (Belen, NM, 10/30/2009). 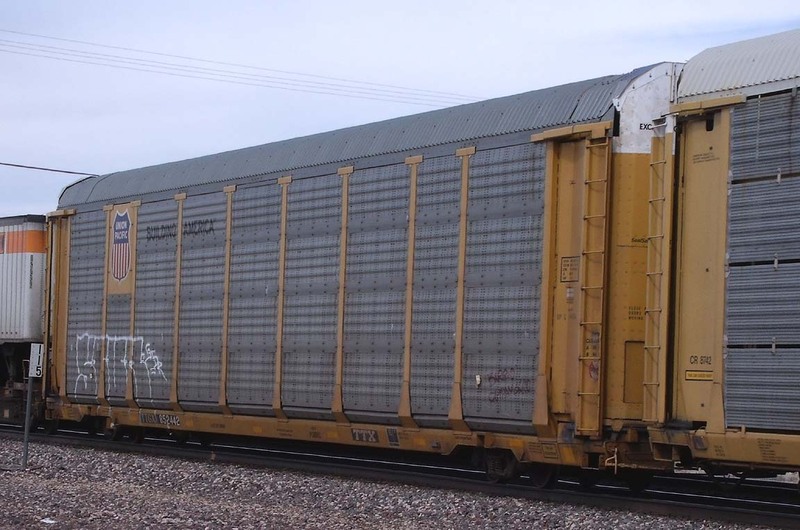 A tri-level CNW rack on ETTX 904299 (near Carrizozo, NM, 2/18/2008). Here’s the rack reporting marks. Tri-level MP rack No. 3907, mounted on ETTX flat No. 902053. It’s seen at Albuquerque on 2/26/2009. Showing its age a bit. Bi-level auto car, originally SP 516842 but now wearing UP colors, east of Scholle, NM in July 2002. Also seen is a tri-level UP auto rack on ETTX flat 820984. Tri-level repainted SP rack No. 517477. It’s seen at Albuquerque on 2/26/2009. 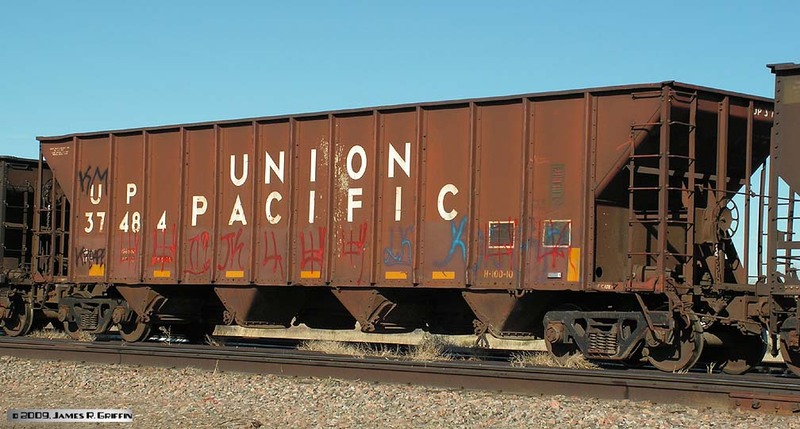 Union Pacific periodically paints cars like this, to preserve their ownership of legacy reporting marks. 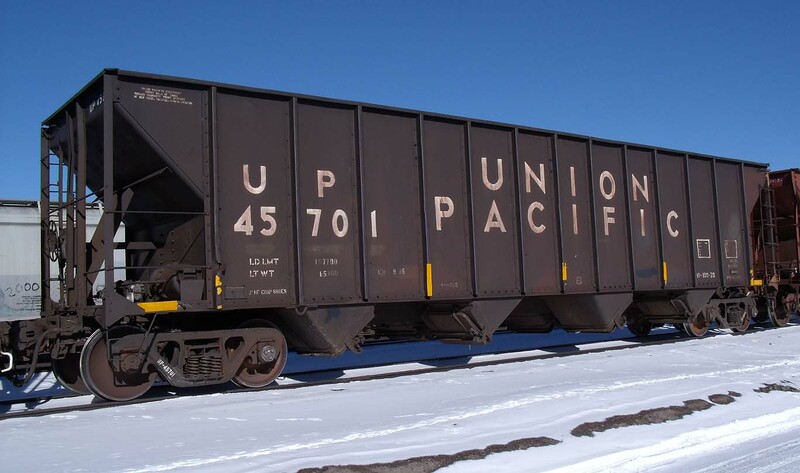 Many SP system autoracks were permanently mated with flats with the same number, i.e. were considered a single piece of equipment. Also, evidently the nameboards were redone when shopped– SP racks had a longer, narrower placard arrangement as seen here. 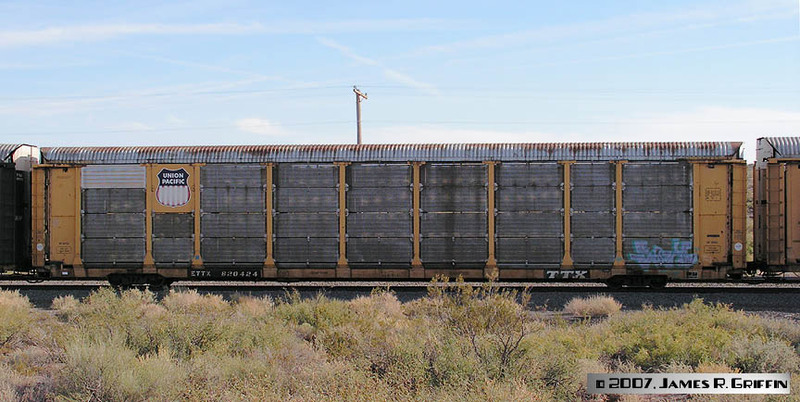 Tri-level rack on TTGX 700237, on a northbound NAFTA train at Rincon, NM (5/08/2016). “Building America” slogan painted on the panels adjacent to the herald. Bi-level autorack on TTGX 852442. It’s seen at Prewitt, NM on 2/21/2011. Tri-level rack on TTGX 985250, on a northbound NAFTA train at Rincon, NM (5/08/2016). Here’s a selection of gons (excluding coal gons, a different category). Chicago Northwestern gondola No. 340512, seen at Denver, CO on 9/01/2008. Chicago Northwestern gondola No. 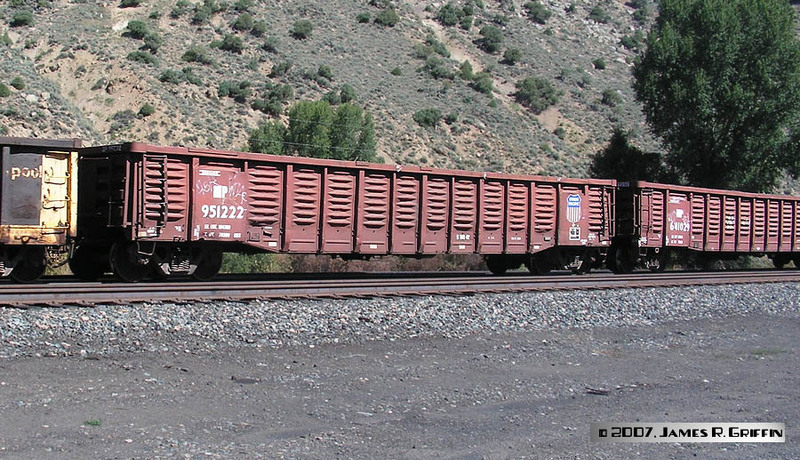 745007, seen at Hot Sulphur Springs, CO on 8/09/2007. 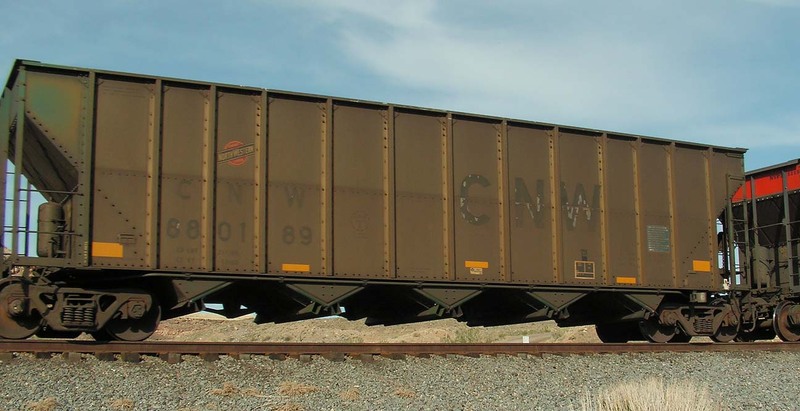 Interior length is 64′ 9″, load limit is 191,100 lbs. Pretty short for a 100-ton gondola, UP No. 229659 is at Hot Sulphur Springs, CO on 8/09/2007. Missouri Pacific gon No. 641069 at Denver, CO on 9/01/2008. Missouri Pacific gon No. 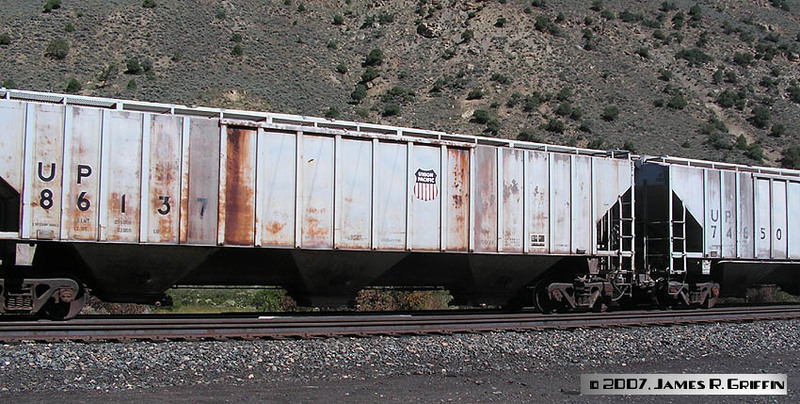 642964, still wearing the MoPac eagle herald, at Hot Sulphur Springs, CO on 8/09/2007. An ex-RailGon gondola, now CNW, is to its right. Missouri Pacific gon No. 643017, now with a UP shield herald, at Denver on 9/01/2008. 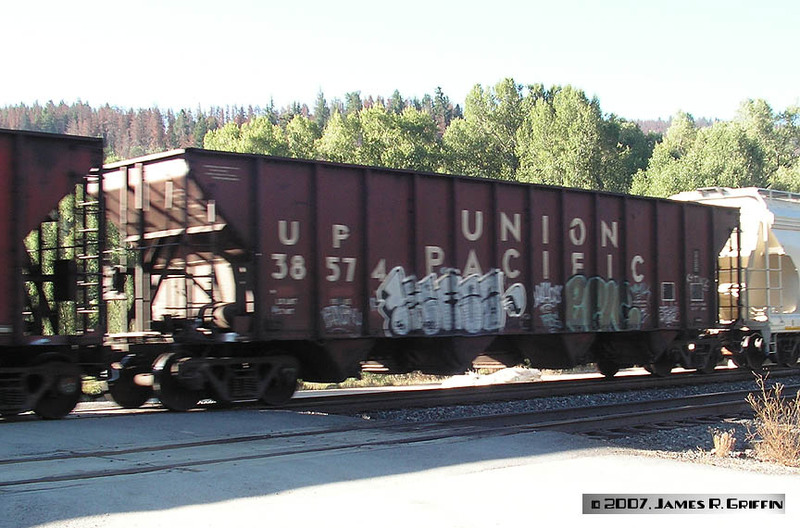 Gon lettered MP 951222 but wearing a UP shield, at Hot Sulphur Springs, CO on 8/09/2007. This category includes covered hoppers from UP and its component roads (except the SP Lines). Covered hopper No. 77265, at Hot Sulphur Springs, CO on 8/09/2007. Long covered hoppers including Nos. 86137 and 74650, at Hot Sulphur Springs, CO on 8/09/2007. 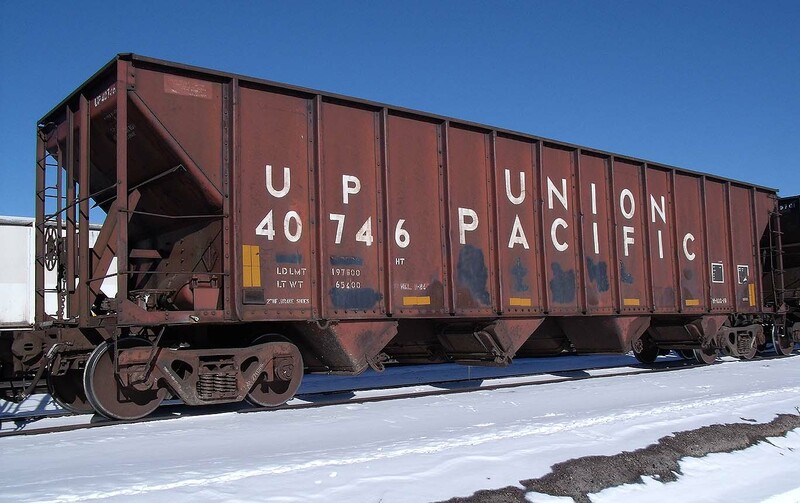 UP three-bay car 76958, possibly Trinity built, seen at Moab Salt on 4/28/2014. All the lettering has faded down to the underpaint. 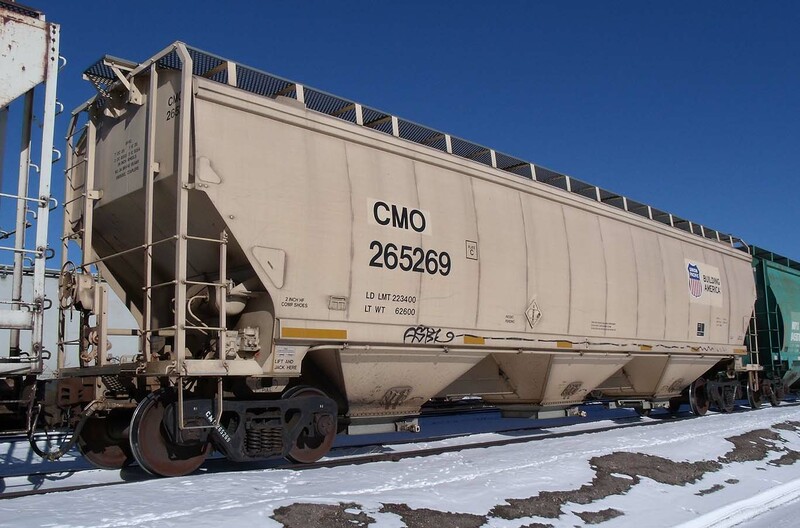 UP covered hopper (CMO) 265269, built by Greenbrier. CMO is actually the Chicago, St. Paul, Minneapolis and Omaha Railway, a granger road absorbed by the C&NW in 1957, itself later absorbed by the UP in 1995. Ergo, UP’s use of the reporting mark is a bit of ledger legerdemain, financial obfuscation, or simple book-juggling. I’m sure they have their reasons. Seen at Alamosa on 12/20/2012. 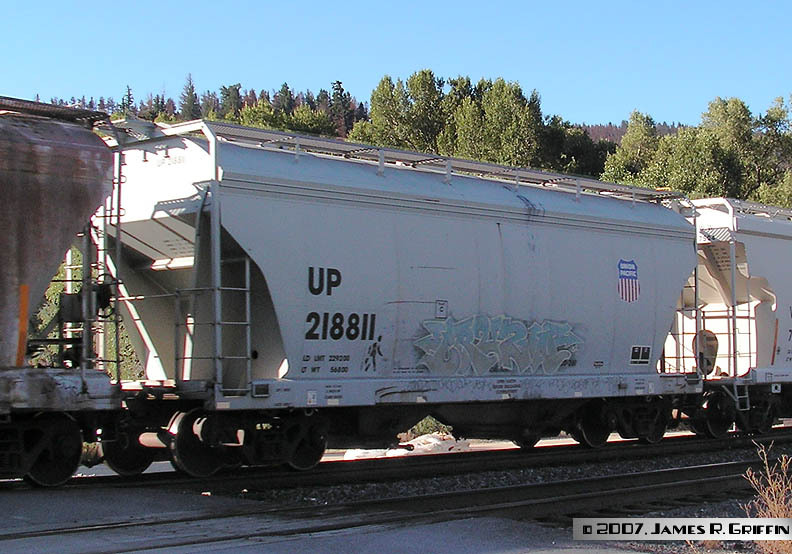 Short ACF covered hopper No 218811 in soda ash service, at Hot Sulphur Springs, CO on 8/09/2007. 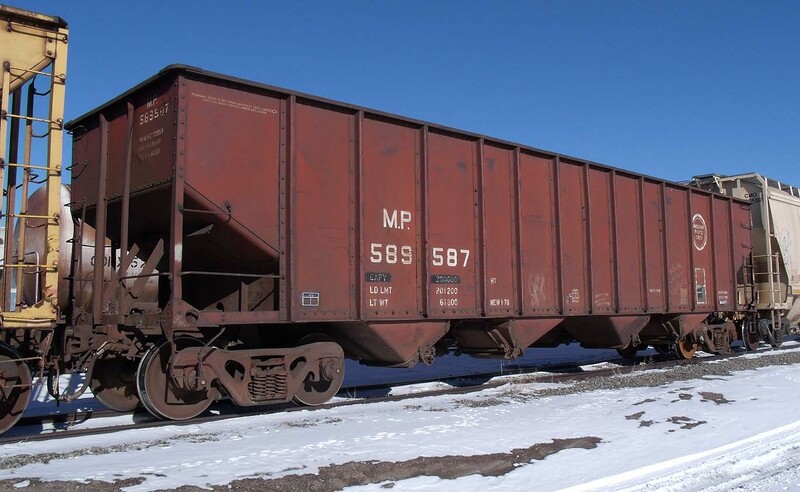 This train was headed for the soda plant at Parachute, CO.
Short ACF covered hopper No. 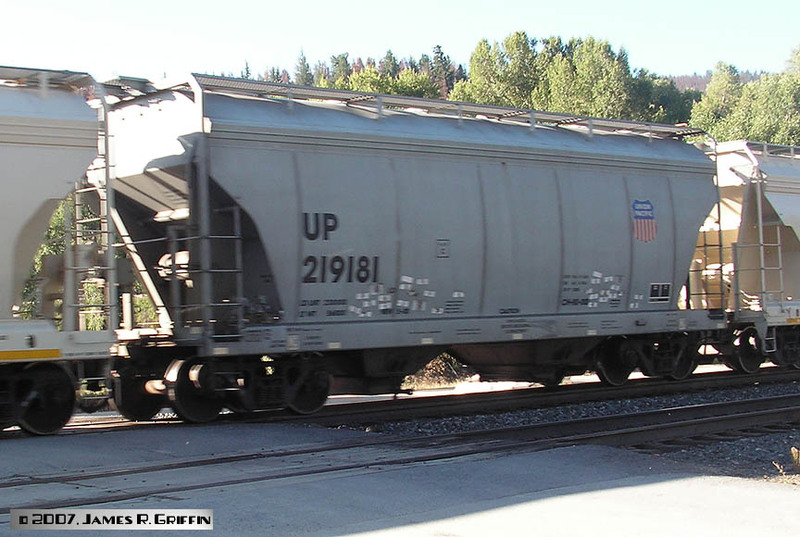 219181 in soda ash service, at Hot Sulphur Springs, CO on 8/09/2007. 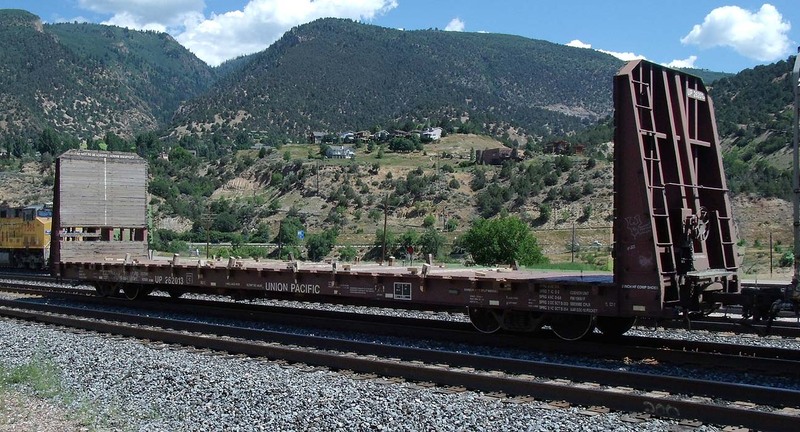 Missouri Pacific 2-bay covered hopper (ACF) 705649, at Glenwood Springs on 7/29/2011. Original paint and much-graffitied. been repainted at some point; compare with 705649 above. MP three-bay car 718967, by ACF. The whole car is covered with some kind of corruption, although the numbers and the original “buzz-saw” herald have been exposed. At Moab Salt on 4/28/2014. MP three-bay car 722719, P-S. 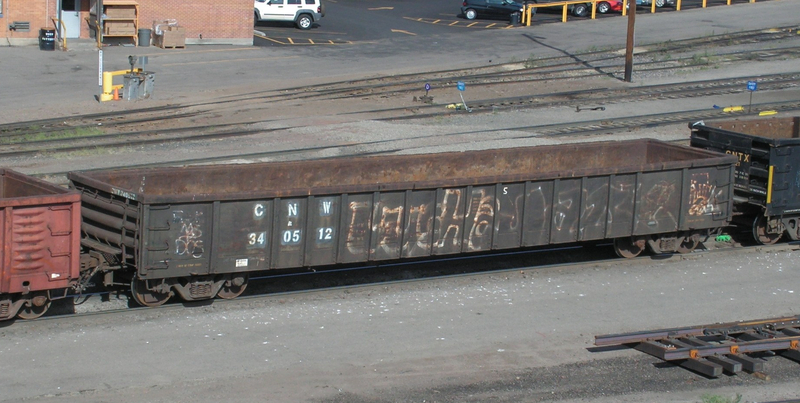 Note the car number has been applied to the center sill between the hopper bays. At Moab Salt on 4/28/2014; built 5/1972. MP three-bay car 723176. Repainted post-merger with a UP herald applied but still carrying its MP marks. At Moab Salt on 4/28/2014. MP three-bay car 723433, by ACF. It looks rusty but it’s actually some kind of stain. The original Screaming Eagle herald has been exposed. At Moab Salt on 4/28/2014. MP three-bay car 724351, by ACF. All the original heraldry has come off, leaving sort of a negative effect showing through the stains. The combo Buzz-Saw/Screaming Eagle herald has been exposed. On the Cane Creek branch north of Moab on 4/28/2014. Built 3/1980. 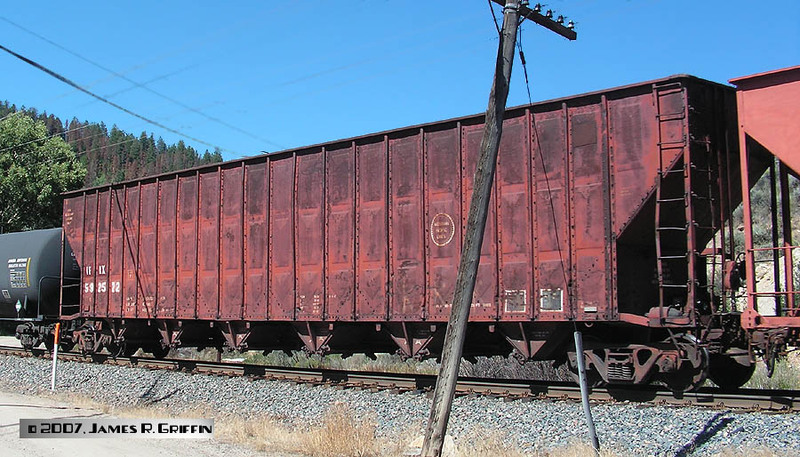 CNW 4750 cu ft hopper 178527, built by Pullman-Standard in March 1980. Other than the herald, the paint’s in pretty good shape for a 34-year-old car. At Moab Salt on 4/28/2014. 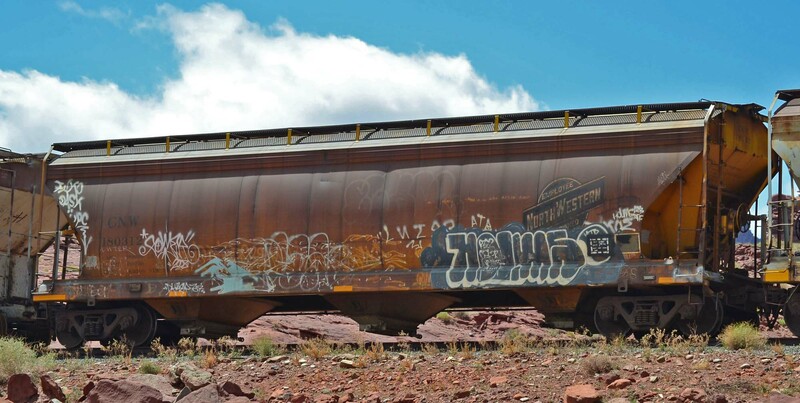 CNW 180312, a heavily weathered and tagged ACF hopper, at Moab Salt on 4/28/2014. Built 10/1977. 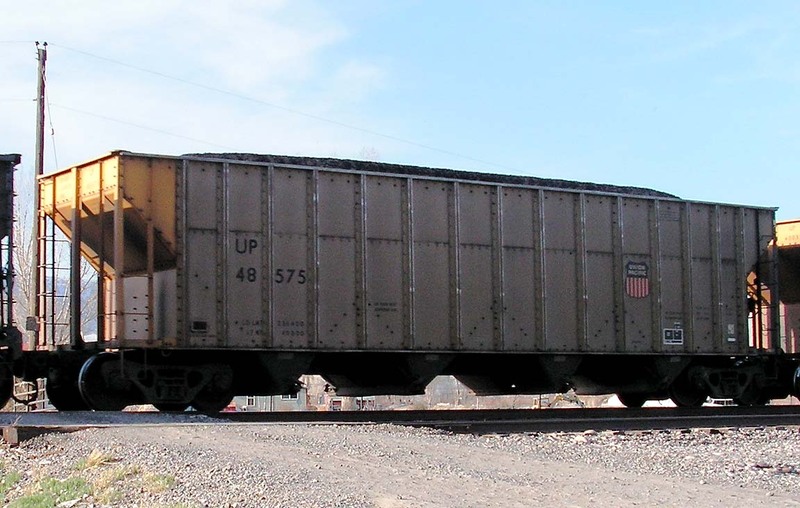 This category includes open hoppers and gondolas (mostly in coal service) from UP and its component roads (except the SP Lines). 100-ton quad hopper 37484, at Alamosa (12/28/2009). The graffiti makes it hard to be sure, but it seems to have been built in August 1974. UP quad hopper 38122, by Bethlehem. Seen at Alamosa on 12/20/2012. Open quads that appear on the SLRG are used to haul scoria rock from Antonito. UP quad hopper 38368, at Alamosa on 12/20/2012. Car built by Bethlehem in 1975. 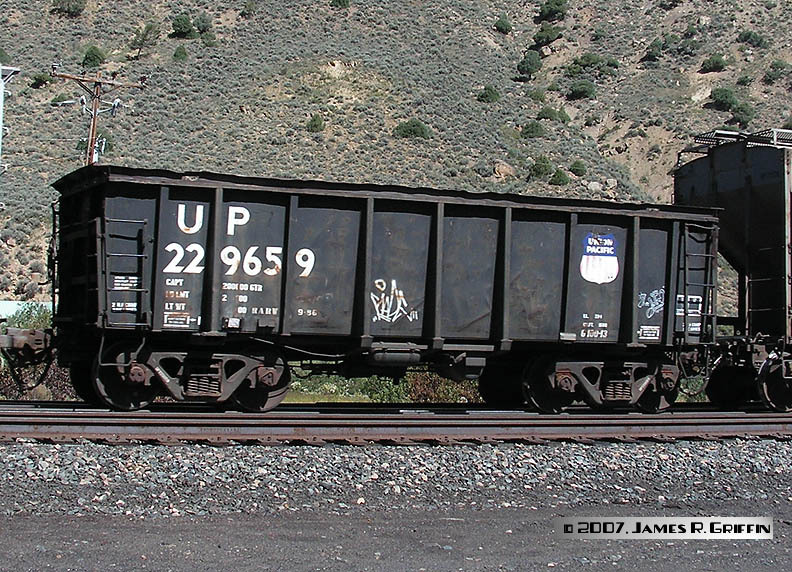 Open quad hopper 38574, seen at Hot Sulphur Springs, CO on 8/09/2007. UP quad hopper 39987. Seen at Alamosa on 12/20/2012. Built by the UP’s Albina shops in 1977. UP quad hopper 40746. Another of the home-built Albina Shops cars, from 1979. Seen at Alamosa on 12/210/2012. UP quad hopper 45701. Built 1980 by UP’s Albina shops. Seen at Alamosa on 12/210/2012. 100-ton quad hopper No. 46026, at Denver on 7/29/2007. This car evidently is equipped with a rotary coupler. Built May 1981. 100-ton quad hopper 46148, at Alamosa (12/28/2009). Built March 1981. 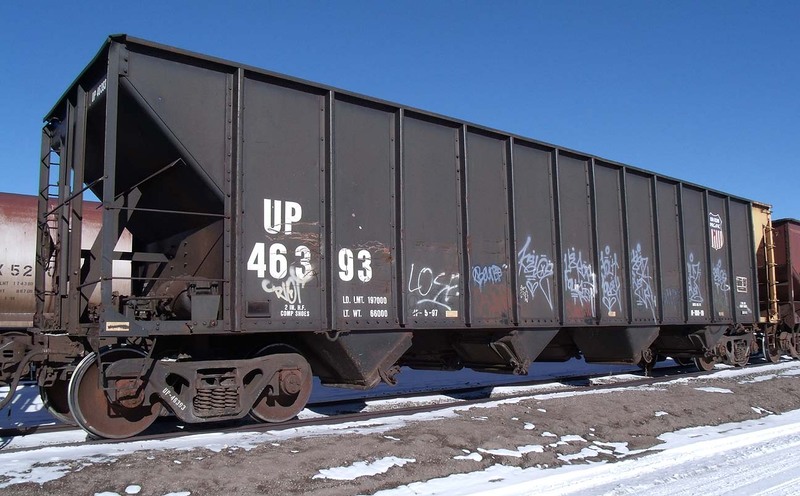 100-ton quad hopper 46393, at Alamosa on 12/20/2012. Serviced (and possibly built) by UP in May 1997. The lettering on this series deviates from UP norms. 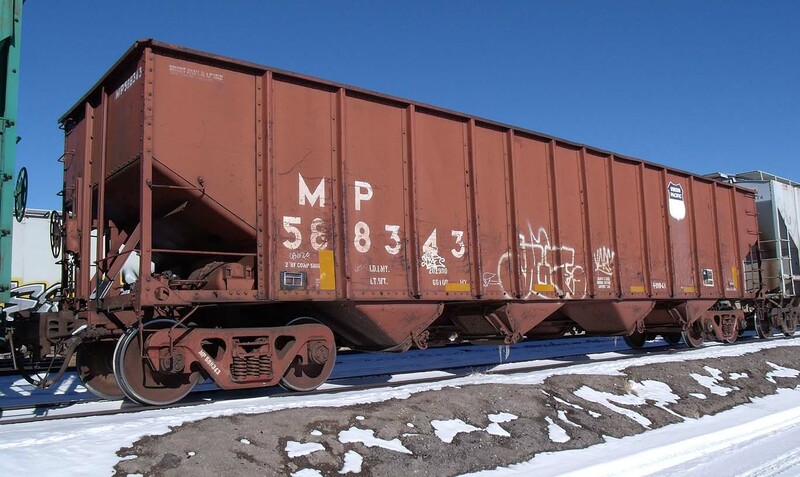 4-bay aluminum hopper, UP 48575 at Delta, CO in April 2010. 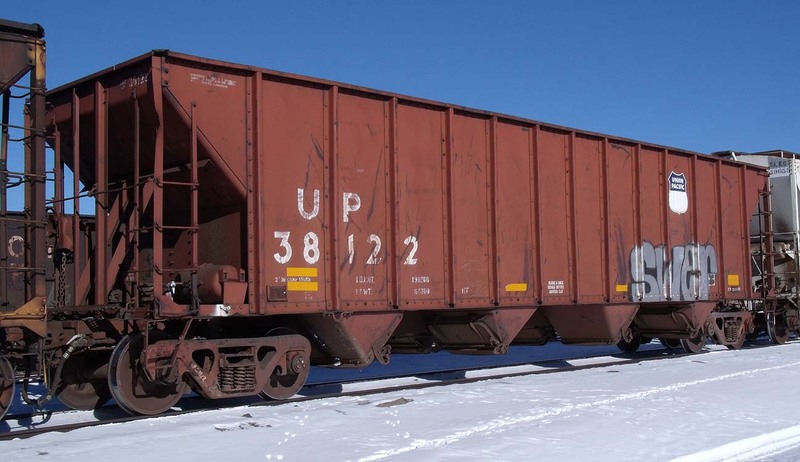 MP 100-ton quad hopper 588343, at Alamosa on 12/20/2012. Built by Bethlehem in 1975. 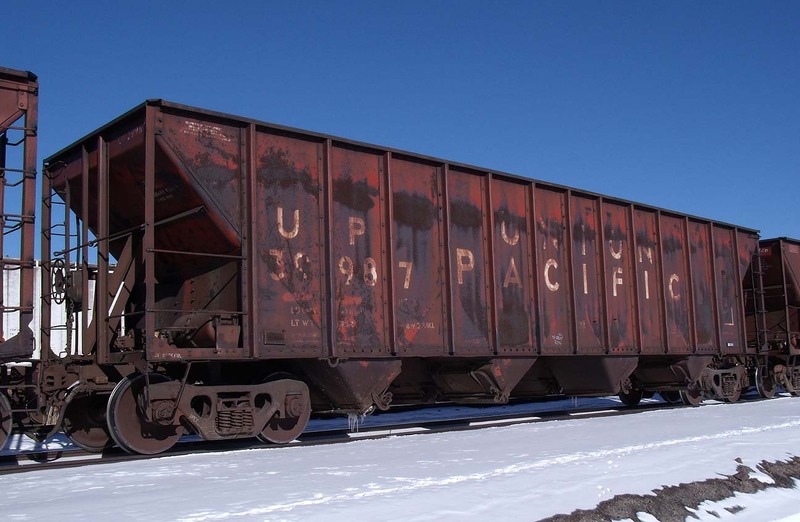 MP 100-ton quad hopper 589587, at Alamosa on 12/20/2012. Built by Bethlehem in 1978. 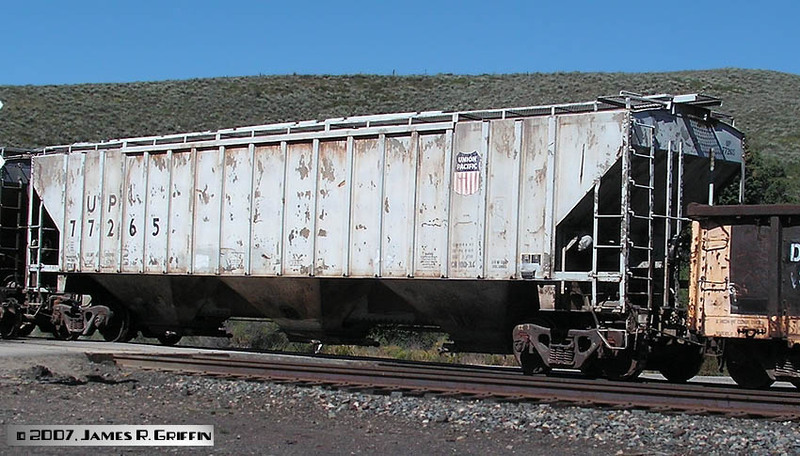 Ex-MoPac wood-chip hopper, now IFRX 592432, rolling through Sulphur on 8/9/2007. This is possibly carrying scoria from Antonito on the San Luis & Rio Grande. These cars are, quite frankly, huge. 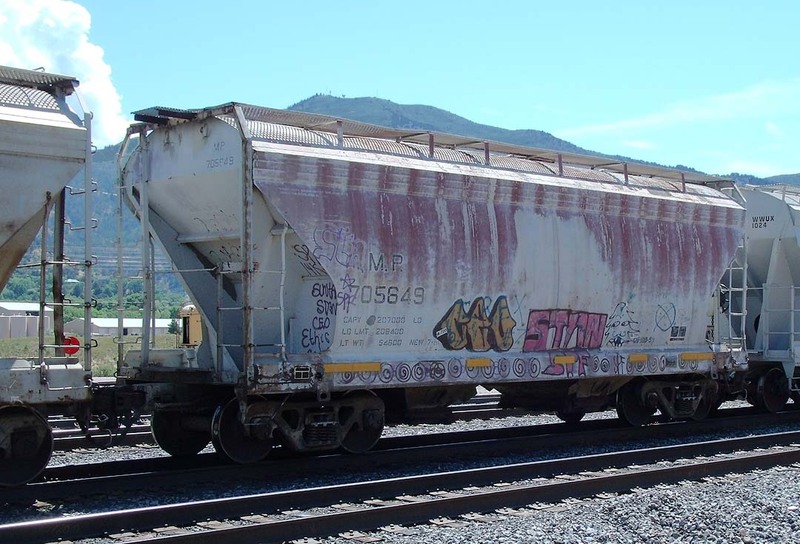 Ex-MoPac wood-chip hopper, now IFRX 592522, rolling through Sulphur on 8/9/2007. See above. 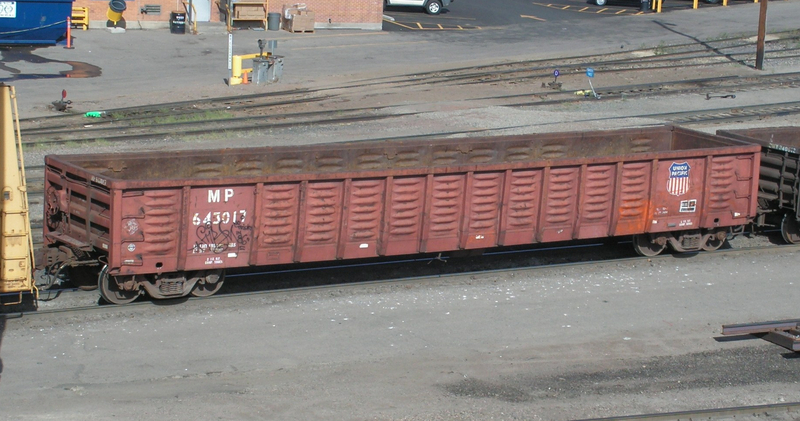 CMO 503615, an aluminum 5-bay hopper built by Johnstown America (JAC) in 2003. Rolling on the North Fork branch near Delta, CO in April 2010. 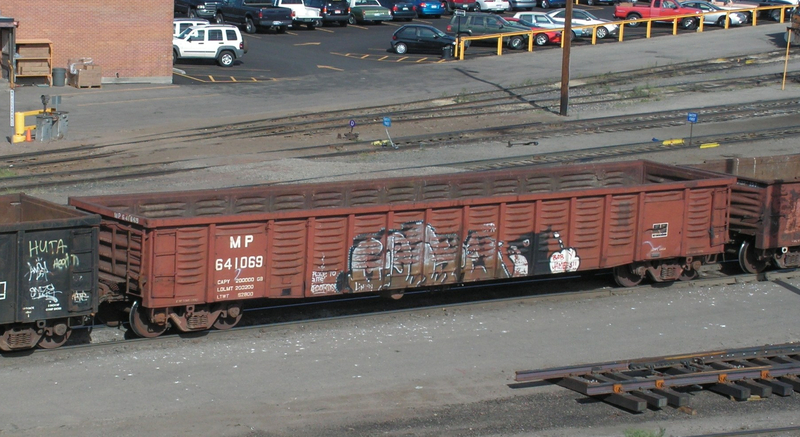 CMO 503845, an aluminum 5-bay hopper built by JAC in 2003. Photographed near Delta, CO in April 2010. 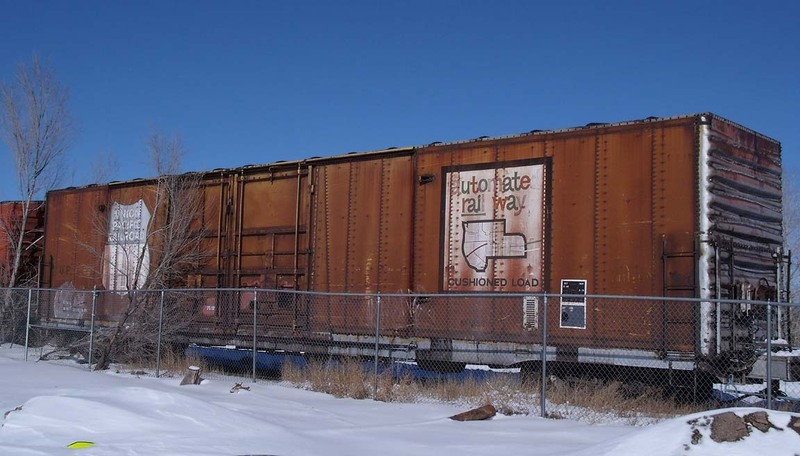 60-foot box car 361139, stored at Monte Vista, CO and now owned by the D&RG. The stencil to the left of the door says “PAPER LOADING ONLY”. 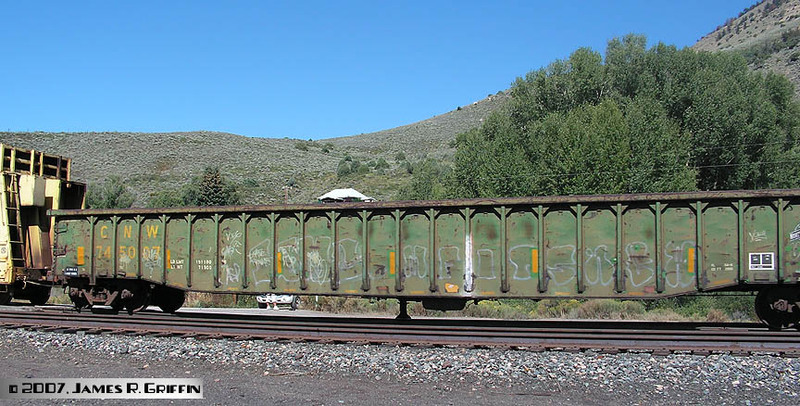 Bulkhead flatcar UP 262013, spotted in Glenwood Springs on 7/29/2011. Built 1998.